There are lots of books that tell you how low carb works. 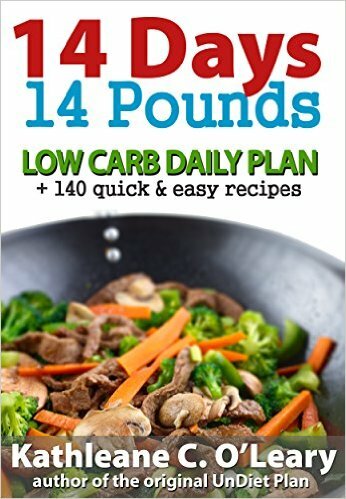 There are even more books that give you low carb recipes. But there are very few books that put the two together and give you a simple step-by-step plan along with the recipes to make it all happen. Everything that you need to lose weight eating low carb is in this book – recipes, menus, Quick Snacks, Quick Meals, Guide to Getting Started on Low Carb, Low Carb Food lists, What To Do After Phase 1, and much more. Indulge in extremely low carb recipes that will make you wonder why you didn’t start eating low carb years ago! There are 26 zero carb recipes and 41 one carb recipes! Most of the recipes are under 6 carbs, and ALL of them are perfect for anyone going through Phase 1 or the Induction Phase of a low carb eating plan. Even if you’ve graduated to Phase 2, 3 or Maintenance, these are recipes that you’ll want to have at your fingertips for days where you need to recover from a high carb meal or two. While the author gives you five recipes per day, if you don’t want to cook on a particular day, just use the list of 0 Carb, 1 Carb, 2 Carb, 3 Carb … foods to replace any of the recipes for that day or use the Quick Snacks section to make a quick meal. Save hours per week with these quick and easy recipes. – The Recipes – 13 categories of recipes! And finally – to make everything as easy for you as possible the author has set up a free service – Shop Hop, which readers can use to automatically build a shopping list using the recipes in the book just by clicking on the recipes! Download The Book ~ Follow the Plan ~ See The Results!